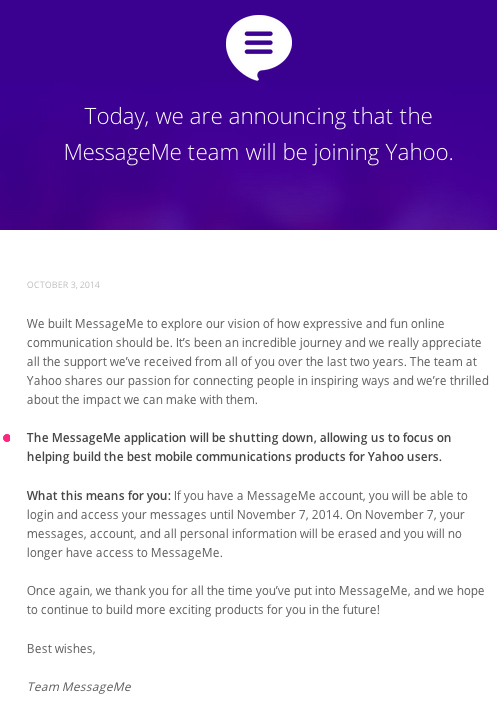 Earlier today we reported that messaging app MessageMe was getting acquired by Yahoo — which MessageMe has now confirmed on its site, along with the inevitable news that the app is shutting down, effective November 7. Now we’ve also learned some more details. MessageMe had also been courted by Snapchat as well as an app maker out of Europe, Truecaller. And, after earnouts retention bonuses, we hear the price that Yahoo will be paying to acqui-hire MessageMe is between $30 million and $40 million. While Snapchat would have made the deal at the same price as Yahoo, we understand that MessageMe chose purple for two reasons: Yahoo is acqui-hiring eight people, more than Snapchat would have done; and at Yahoo the team will get to stay together to work on a new messaging product. Working on a new messaging app, in a sense, could represent closure, or perhaps a continuation, for the MessageMe team after they shut down their eponymous app. Its demise is unsurprising for a couple of reasons. It’s often a consequence of acqui-hires that the original product does not survive. Yet the writing may have been on the wall regardless of that. MessageMe had picked up over one million users, but when you consider that WhatsApp now has around 600 million users, you realise what a steep hill the startup would have had to climb to really benefit from network effects — these apps only really hit their stride when everyone you know is using them, too. Littlebits, the company behind MessageMe, actually still had a significant amount of cash in the bank from the VC money it had raised, and its investors had been encouraging the company to try something else. However, from what we understand, the prospect of abandoning messaging, which had been the startup’s main, engrossed focus, was simply not as appealing as having another crack at getting the messaging business right. Which is what Yahoo will be letting them do. Of course, it won’t be without challenges. Apart from the massive messaging app incumbents like WhatsApp still being there just like they were yesterday and today, there could be new (and huge) other entrants on the way — namely, Google. And that’s before you wonder if the MessageMe team and Yahoo will manage to tap into something unique that will set their own messaging effort apart from the crowd. As a MessageMe user myself, and an advocate of competition, I kind of hope they do.